On 10-11 November, Kyiv hosted International practical conference “Road map for Ukraine in the sphere of waste management and electronic governance” organized by the Embassy of Sweden to Ukraine and International charitable organization “Environment-People-Law” that gathered stakeholders representing the state, waste processing business in Ukraine and European countries, the public, experts in the sphere of waste management and electronic governance. 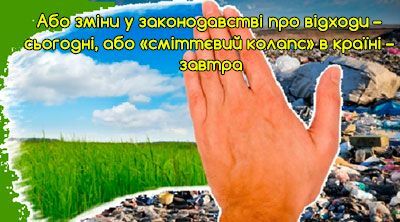 Waste management is one of the most pressing environmental problems in Ukraine. There is no system of waste sorting and processing. Such types of waste as medical, electronic and electric waste, automobile tires, food and construction waste are disposed to landfills together with domestic waste. Landfills for solid domestic waste do not comply with environmental norms. The number of unauthorized landfills increases every year currently numbering about 33 000. Ukraine lacks control over availability of technical capacities at hazardous waste processing enterprises, there is no supervision over the process of disposal of hazardous waste by licensed companies. As a result, hazardous waste gets to landfills. In order to solve the problem of waste management on the national level, it is necessary to create an effective national system of waste management that would be based on the following basic principles: prevention of waste production, segregation of waste, transportation of waste to waste processing points and transformation of waste into energy and material resources, producer’s responsibility for produced waste, ensured state funding of unprofitable stages of waste management. With the aim to introduce conceptually new approaches in the sphere of waste management, to bridge the gaps in the national legislation and harmonize it with norms and standards of EU law in the sphere of waste management and having taken account of recommendations of participants of the International practical conference, EPL prepared the Agenda for Ukraine in the sphere of waste management that can be viewed here. Modern state governance in the sphere of environmental protection including waste management is impossible without wide use of information technologies – electronic governance. Withtheaimtoensurepublicaccesstoenvironmentalinformationandintroduceelectronicgovernanceinthesphereofenvironmentalprotection and having analyzed results of the conference, EPL prepared the Agenda for Ukraine in the sphere of electronic governance that can be viewed here.